How can I use graphs in the geosciences? Advances in technology have meant that geoscientists can collect large volumes of numerical data in short periods of time - from geochemical analyses of rocks, to measurements of angles, to the composition of the atmosphere. 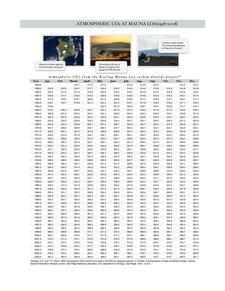 With all those numbers (like the table of carbon dioxide measurements to the right), how can we tell what the data is telling us? One way that geoscientists process data is to use x-y plots (those with two axes). Any geoscience data that show a relationship between two variables (distance vs. elevation, velocity vs. depth, etc.) can be plotted on an x-y graph. Some examples in introductory geosciences include topographic profiles showing what the land surface looks like, velocity of earthquake waves in the earth, the likelihood that a river will flood, the rate of glacial retreat. Why should I use x-y graphs? 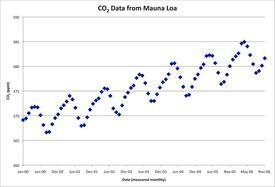 Monthly Mauna Loa CO2 data (shown above) plotted on a x-y graph showing seasonal changes. Bivariate (or x-y) graphs help us to visualize and categorize large volumes of data (like that at the right) without having to sort through cumbersome data tables. Imagine having to look at a table of 50-100 pairs of data and trying to figure out the relationship of one variable to another! It's much easier to see the relationship on a graph or plot! 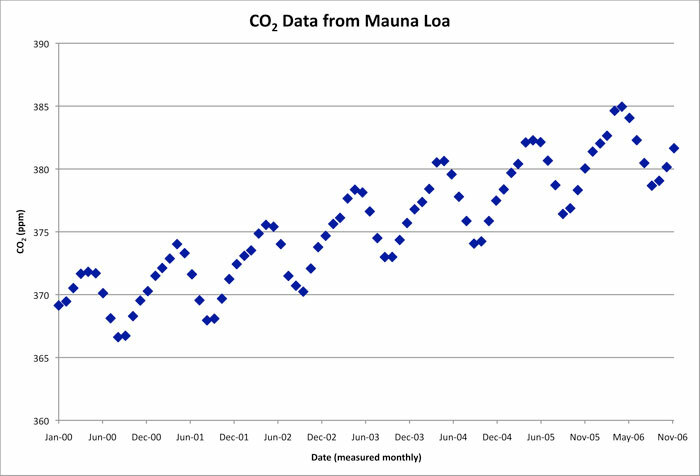 For example, looking at the table of data for atmospheric carbon dioxide collected on Mauna Loa, you might never recognize the important seasonal trends in the data that show up when 7 years of data (2000-2006) are plotted (to the left)! Plot elevations along the line A-B on the graph provided to construct a topographic profile. Plot the data in a table on the graph paper provided. Using the data in the table provided, plot mean elevation on the vertical y-axis and the date on the horizontal x-axis. Construct a line through the points you plotted (or that are already plotted). In introductory geosciences, there are two ways that you may be asked to do this. The following are examples of types of questions that you might see in a typical question that asks you to draw a best-fit line. Draw a best fit straight line through the data points to construct a flood frequency curve. Fit a line to the data to estimate slope. Approximate the trend in the data by fitting a straight line to the points you plotted. Plot your data and draw a smooth curve connecting the data points; that is, do not connect the points with straight-line segments, but estimate the curvature between points as best you can so the entire curve bends smoothly. Once you've plotted elevations along the line A-B, connect the points with a smooth line to construct a topographic profile. Read points off a line (either the one you constructed or one that is provided for you). The following are examples of types of questions that you might see in a typical question that asks you to read a point from a line. Use the flood frequency curve you constructed to determine the maximum stage for a 75-year flood. Use the travel-time curves to determine the the time it takes for P- and S-waves to travel 1000 km. Using the curve you constructed, determine how many half-lives have elapsed when the Daughter/Parent ratio is equal to 15. You can complete the pages linked above with no extra help. If you feel like you need more help, or more information about graphs, here are some links to help you think about graphs on the whole. Visionlearning has a page about visualizing scientific data and it was written by a geoscientist! The Gallery of Data Visualization has the best and worst of graphical representations.